They are available right now as a video download as part of my new Latest in Clinical Nutrition volume 26 (all proceeds go to this charity). It can also be ordered as a physical DVD. The smoothie videos are all scheduled to go up on NutritionFacts.org in September, but you can download and watch them right now. Wait a second. Why spend five videos sifting through the science, profiling all the original experiments, and turning it into one big detective story when I could have just cut to the chase and did a five second video and basically said “Drink them” or “Don’t drink them”? Because I don’t want you to ever do anything just because I or anyone else “said so.” That’s one of the problems with the field of nutrition. Everyone seems to have their respective gurus who too often make pronouncements without explaining their reasoning and citing their sources. Can you imagine that flying in any other field of science? It’s not what he said or she said; it’s that the best available balance of evidence bears out. Two plus two equals four no matter what your favorite mathematician says. 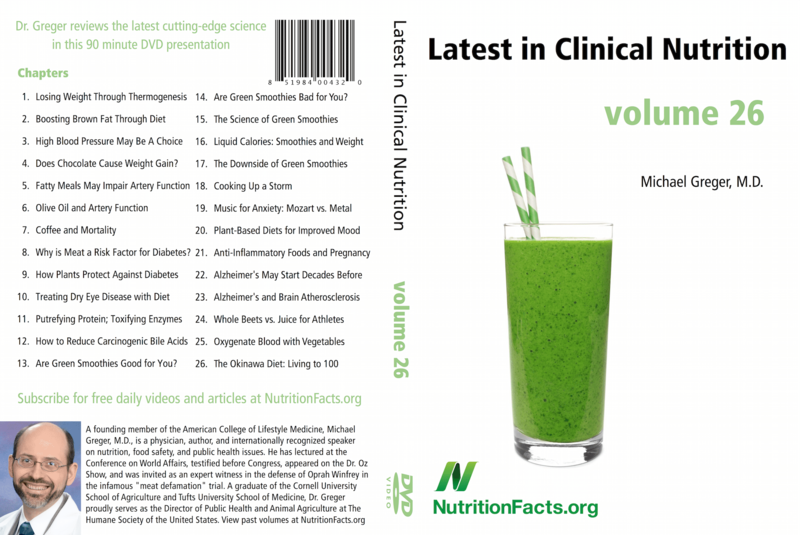 The current batch of videos from volume 25 on NutritionFacts.org just ran out, so starting now and running until October, I’ll be rolling out the videos from this new DVD, volume 26. The DVDs give folks the opportunity to sneak-preview videos months ahead of time, watch them all straight through, and share them as gifts, but there is nothing on the DVDs that won’t eventually end up free online at NutritionFacts.org. If you’d like the works–40+ hours of video–you can get the complete DVD collection. If you were a regular supporter, you’d already be a smoothie expert by now, having already received the new DVD. I now come out with new DVDs every 9 weeks. If you’d like to automatically receive them before they’re even available to the public, please consider becoming a monthly donor. Anyone signing up on the donation page to become a $15 monthly contributor will receive the next three DVDs for free (as physical DVDs, downloads, or both–your choice), and anyone signing up as a $25 monthly contributor will get a whole year’s worth of new DVDs. If you’re already signed up and didn’t receive your volume 26 yet, please email Tommasina@NutritionFacts.org and she’ll make everything all better. Thanks to everyone who donated to the NutritionFacts.org Research Fund, we were able to test eight brands of nutritional yeast for the presence of the toxic heavy metal lead. The good news is that we couldn’t find any in most brands, but a few did have detectable levels. The lead contamination was so low that all brands complied with the exceedingly (and justifiably) strict California Prop 65 standards, but I do I advise pregnant women who eat more than a third of a cup a day on a regular basis choose one of the brands that tested free from detectable lead until we know more. Joseph includes details and direct links to all the testing reports in this morning’s blog post Three Brands of Nutritional Yeast Contain Detectable Lead Levels But the Risk is Minimal. What should we test next? Please post your suggestions to the Research Fund page. The new videos coming along, sound very “delicious” as has come to be expected. I have been a ail/7:00 AM Central Time reader/listener for a number of years now. While I have “studied” health for decades, with this information, I have never been in better health, tons of oxygen, feeling great. Every meal – you have me thinking…. ?add Turmeric?with Black Pepper?/Cinnamon?, Best Apple, Best Nut?, to eat nuts or not? Seeds?/What to drink and when. And love your extended videos/especially the YouTube sensation/two hour overview of Vegan Nutrition. That one is VERY special. I highly recommend it. The incredible amount of time and effort you and your team expend on our behalves is truly a “gift from GOD!! !”/see definition of enthusiasm…. Thanks so very much, Dr. Greger, and all who are involved and contribute time and treasure. David: can you please post the link to the Youtube video you’ve mentioned? I’ve seen many a video of Dr. Greger on Youtube but have never found one two hours long. Thank you. Amen David, couldn’t have said it better! Nutritionfacts.org/Dr Greger and volunteers provide invaluable evidenced based advice about health and wellbeing. With all the hype and nonsense that’s published its no wonder that those sincerely wanting to adopt healthier eating habits are often misled and discouraged. A couple cliffhangers in this one that will create a lot of angst. ;-) Glad I have a copy of the DVD! Really awesome volume. I particularly like it because it does a great job of addressing some of the common questions that come up again and again in the discussions. 2+2 Doesen’t always equal 4. Check out Kurt Godels Incompleatness Theorems. This seems like a total non sequitur. What statement are you responding toward and what do the incompleteness theorems have to do with it? Dr. Greger says in his video synopsis “Two plus two equals four no matter what your favorite mathematician says.”… just pointing out that in godels papers from my understanding he mathematically proved basically 2+2=4 is just a strong tendency of 2+2, not a mathematical absolute. I suspect you are misunderstanding the implications of Godel’s theorems, especially for society. If you accept logic and arithmetic, 2+2=4. 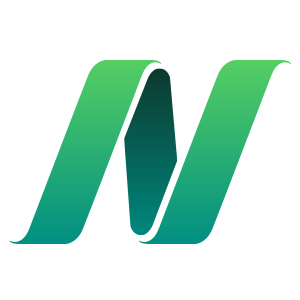 That equality can be derived from the axioms in any formal logic system which represents the natural numbers with finite applications of the addition operation. It’s not one of the statements in these systems that makes the system incomplete by not being provable or disprovable; it is simply proven. The first theorem doesn’t impact the formally correct proofs that 2+2=4 in every system that deserves to be called an adequate representation of basic logic and arithmetic. As for the second theorem, we only know that we cannot show that a system of axioms for logic and arithmetic is sound, in that it does not derive a contradiction ever. In other words, we cannot necessarily prove that there isn’t a proof that 2+2!=4. This doesn’t mean that we shouldn’t accept arithmetic as sound, though, or treat it as anything other than a mathematical absolute. If you want to dispute this obviously useful system for drawing conclusions about the world, then produce the contradiction, or demonstrate that one of the axioms leads to unreasonable conclusions in practical applications. Until then, let’s treat it as absolute (and not just “a strong tendency”), just as we always have. Formally, we have always simply assumed that some basic axioms of logic are true even prior to Godel, so he isn’t really the one to yank the rug out from under our feet here. You are showing modular arithmetic, not the representation of numbers in a base different from ten. ‘1+1=10’ in base two, and ‘2+2=10′ in base four, but in base four ’10’ means the same thing as ‘four’, so two plus two still is equal to four. You are kind of equivocating between the way that we use symbols to represent numbers, and the logical-arithmetic structure that determines the numerical result of a particular sequence of arithmetic operations. I mean, we could go further and define a completely silly system for ascribing meaning to the symbols ‘2’, ‘+’, ‘=’, ’10’, ‘5’, and ‘4’, then derive that “2+2=4”, “2+2=5”, “2+2=10” are true propositions while “5+5=10” is false, but this would be entirely irrelevant to what we mean when we talk about the sum of two and two. but this just adds more evidence! otherwise, let me just add a few related ideas. trying to point out that there are some statements that are not just some experts opinion! It would be really helpful if your donation page had a category for the $15/monthly you’re asking for. This is the second time I’ve tried to donate to you and couldn’t get your donation page to work. The site won’t accept my indication of “Other $15.00.” Suggestions? What does it say when it rejects your attempt? Did you enter the captcha correctly? Do you get to the second page where you enter payment, or do you fail to pass through the first? It doesn’t take me to the second page. It says something like “amount entered incorrect.” Yes, I entered the captcha correctly. I tried several different captchas. Provided that all your info is correct, it sounds like you just need to try with a different browser/OS until you get it to work. I have no problems getting to the second page with Firefox. So… are green smoothies good for you? Yes or no? Any plans to offer Blu-ray as a purchase option? For such text-heavy presentations, 1920 x 1080 pixels would be much crisper and easier to read than the 720 x 480 of DVD. I’m a monthly donor – how do I download this video?